Oof, tough question, but you can make it easier by marking what you know on the diagram (forgive my awkward mouse-drawn diagram). All you know is that AB > AC, but it's definitely an isosceles triangle. What do you know about isosceles triangles? 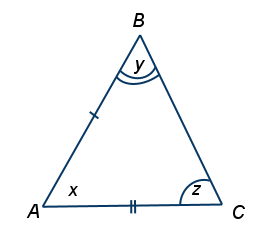 The big thing that's always true about them is the angles across from the equal sides are also equal. SO, the only thing we know for sure is that the angles across from our unequal sides have to be UNequal. y is acrosss from AC, and z is across from AB, so y cannot equal z. Our answer is (E).